Meet the love of my life. Nannah is my first goat. I got her to be a nurse maid to a bummer foal I rescued several years ago. The foal never did take to nursing her and she really wasn't interested in that part either, but she was a great companion to him and I know she helped him to pull out of his funk and was partly a factor in saving his life. She is quite a character. I used to take her with me to my horse shows because inevitably I had to be signed in right at milking time for her. She didn't mind and kept the horses company through out the day. We were quite the site I'm sure lol. She is a fantastic mother and milks a ton!! She is the bar that all my other does are measured by as far as taste goes. Her milk is awesome! 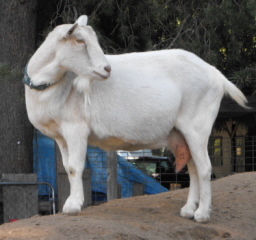 She also milks for 2 years really strong and loves to milk! She has been retired from production due to severe mastitis issues on one side that she's dealt with since before I was blessed to own her but she can live out the rest of her life here and be totally spoiled & pampered. We love this doe!